offers the fastest method by copying the adjacent pixels, but results are often poor. Good for upscaling screen shots but not much else. looks at pixels above and below plus left and right and averages out the result to give an intermediate pixel and a smooth blend. looks at all the pixels surrounding each pixel and averages them all out to create the new ones. It then boosts contrast between each pixel to reduce softness. 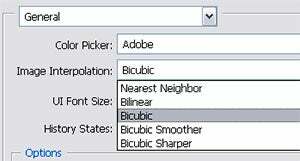 is variation of Bicubic and is designed to be used when you enlarge the image. is yet another variation of the Bicubic setting this time customised for reducing the size of photos. In the latest version of the software it is not possible to change the default scale settings.